The Parisian skyline is dominated by only several tall structures, notably the Eiffel Tower and the Tour Montparnasse; however, by 2014 the cityscape will welcome a new addition in the fifteenth arrondissement. 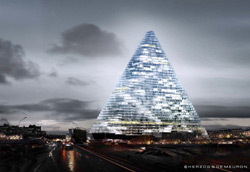 Dubbed le Project Triangle, or the Triangle Project, the eventual construction by architects Herzog & de Meuron will measure up to 180 meters tall. Most of the buzz relates to the building’s pyramidal block structure (read: shaped like a flat-edged brie wedge). It won’t cast any shadows on nearby buildings and the positioning permits optimum solar and wind power generation. The architects didn’t want to build on the city. Instead they aim to create a “vertical city” that showcases scenes of life, taking a slice of Parisian dynamism and standing it upright. The public will be able to access the Triangle Tower’s first level, full of retail spaces and food. The other floors will consist of offices, a business center and a 400-bedroom hotel. The function accurately fits the need of the Porte de Versailles area, home to Paris’s Parc des Exhibitions convention center. Herzog & de Meuron’s design also marks the revolution of Parisian urban planning. In 1977, then-Paris mayor Jacques Chirac banned any constructions over 37 meters tall. Prior to this, nineteenth-century Haussmannisation established a six-story height on all immeubles. In November 2007, the French government raised the bar with respect to building height, allowing structures of all sizes in order to address the housing shortage and stimulate the Parisian economy. The city plans to approve twenty high-rise designs, with the Triangle Project as the first.